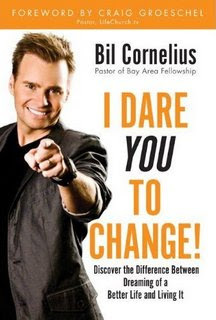 Today, I bring you an interview with Bil Cornelius, the author of I Dare You to Change. If you’d like a chance to win a copy of the book, be sure to leave a comment at the end of this post. Q: What was your inspiration when writing your new book, I Dare You to Change? Those are both true for the changed individual, but I guarantee they also had a plan in place and they worked their plan. I wanted to take the mystery out of life change without taking the miracle out with it. Q: Why do you think God places promises beyond a person’s current reach? God is interested in our growth more than our comfort. One of the biggest reasons why God gives us dreams bigger than our abilities is so we have to depend upon Him for their accomplishment. Another phrase I use often is people use people to get tasks done, but God uses tasks to get people done! He gives you an assignment bigger than you are for one reason only…to grow you. Q: How can a person protect herself/himself from slipping back into old habits? The best protection from moving backwards is to always be moving forwards! This is why setting new goals is a continuing process…or, as the Bible says, we go from glory to glory! Accountability is important as well as a strong routine, but nothing takes the place of forward movement! Q: How does someone go about changing their life when they feel so overwhelmed? The first step when wanting to change something in your life, especially if overwhelmed, is to pray and break it down into bite-size chunks of change. The prayer part is obvious, but most people don’t do it. Prayer releases God’s confidence in you, so you have the vision and power from God to move forward. What comes next is a good strategy: if something is overwhelming you, it’s typically because we are thinking of changing everything at once (or one really large change) rather than breaking into a series of smaller changes. You may not be able to own a high rise in New York City, but you can buy a small fixer-upper home, work on it, get it rented, and then do it again. If you are consistent enough with this, within a few years you can sell it, take your profits, and reinvest them into a 4 to 6 unit. Sell this a few years later and you can invest into a 15 to 20 unit. Sell this a few years later and reinvest into a small office building. Sell this…you get the point. It’s all about taking baby steps first. Another angle is if you want to lose 50 pounds, lose 5 first and keep going. Q: You write that encouragement is important. Who has been your greatest encourager? My greatest encouragers vary, but the most consistent are the Holy Spirit, the Bible, and my wife Jessica. My time with God keeps me going, and when I’m stuck, nothing can replace a loving example and encouraging word that comes from my closest friend in the universe, Jessica. She always knows just what to say when I need it. * Click here to see the book trailer. * For a sample chapter, click here. * Click here to purchase the book at Amazon. Sounds like a great book, Lynn! Interesting. I looked at the cover and thought it wasn’t for me, but now I think it might be. It’s not the desire to change that I lack. It’s more that I put it off rather than put it into action. This book sounds like a new plan for the new year. Thanks! Thanks for the interview Lynn, I think it is an interesting book. Isn’t it true that there are two things people don’t like? The way things are and change! I would absolutely love this book! In fact, I NEED this book! I was just telling a friend that I need more in my life and really don’t know where to turn at times. I really thing this book might help. I need a big change! Sounds like a wonderful book my friend. Hugs! With 2011 firmly here, this may be just the kind of book I would like to read. It is funny because I too was put off by the cover. I’m glad I read your post. Going through a tough time right now. Would love to read this. I would love to have this book to give to my dad. He gets so overwhelmed with work and I think life soemtimes.